The 9600 module is a sixteen-channel audio embedder or disembedder for 1.5 and 3 GB/s high definition video signal or 270 Mb/s standard definition signals. Eight AES ports automatically configure as inputs or outputs depending on if the module is configured as mux or demux. Additionally, four channels of analog audio are supported. When configured as a multiplexer, the 9600 has one serial digital video input and eight AES audio inputs. 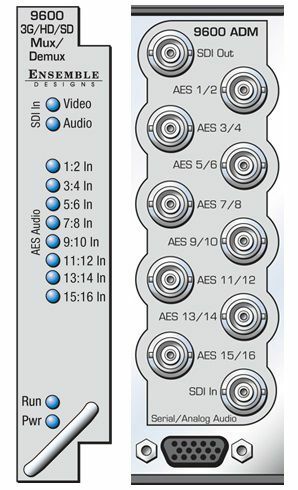 These eight AES streams are embedded into the video stream. AES inputs are sample rate-converted, allowing the use of asynchronous audio. The output of the module is a digital stream that contains the original video signal and eight AES pairs, or sixteen channels. The 9600 includes a full-featured, sixteen-channel audio mixer. The channel swap and shuffle capability allows you to completely rearrange and remix audio channels. It provides precise control over audio level, with up to 12 dB of gain to compensate for low level sources. Delay is adjustable up to one second. Because the 9600 has simultaneous disembedding and embedding, it is an in-line processor for embedded audio. It can take embedded content, adjust levels and remap channels, and deliver it to the output as an embedded signal. The 9600 can be fitted with Dolby and AC-3 encoding and decoding options. The 7615 decoding option can be fed from either an AES input or an AES stream disembedded from the incoming SDI signal. The resulting discrete surround signals are then selectable as inputs to the sixteen channel mixer/shuffler. The 7630 Dolby encoder is fed from selected outputs of the sixteen channel mixer/shuffler. The resulting encoded bitstream can be output both on an AES output and embedded into the SDI output. Additionally, the 9600 fully supports embedding and disembedding of encoded multi-channel bitstreams such as AC-3 and Dolby E.
The 9670 LevelTrack™ Audio Automatic Gain Control software key can be added as an option. LevelTrack provides control for keeping audio levels consistent in program material. The 9690 Audio Compliance and Monitoring Software can be added for compliance verification and archiving. The 9600 can be configured locally or controlled and configured remotely with Avenue Touch Screens, Express Panels, or Avenue PC Software. Alarm generation, configurable user levels, module lockout, and customizable menus are just some of the tools included in the Avenue Control System.